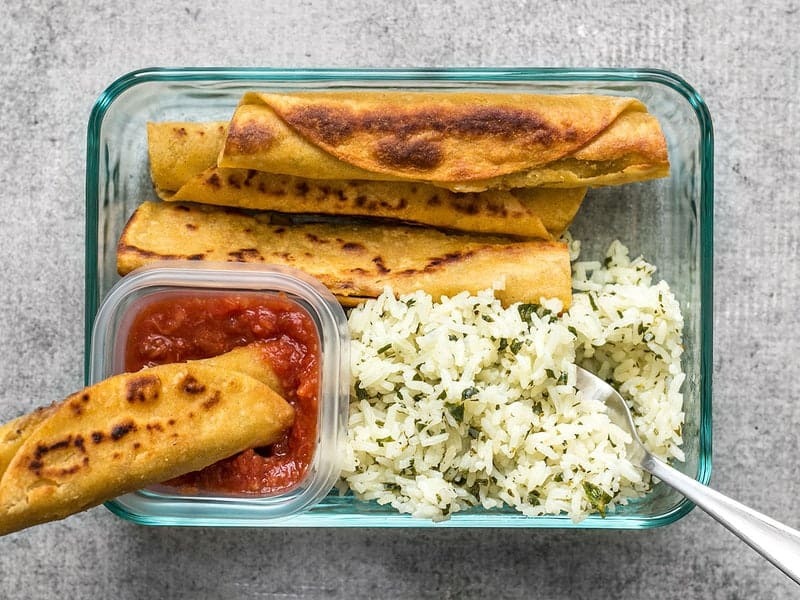 I know the first question I’ll get in the comments is, “How do you reheat the taquitos and keep them crispy? ?” and the answer is that you don’t. They don’t stay crispy and I’m okay with that. I reheat them in the microwave and they’re still yummy. With meal prep you have to be okay with the fact that your reheated food is not going to be exactly the same as when it was freshly cooked. Instead of focusing on the fact that it’s not the same, I focus on the fact that it still tastes great and I’m still really thankful to have an awesome, delicious, and inexpensive home cooked meal. My taquitos may not be crispy, but they’re delicious and my whole lunch was about $2 instead of $10. And that really adds up over time. If you’re not a fan of cilantro, my Easy Taco Rice is a great substitute! The original recipe for the Cilantro Lime Rice makes six cups, but I didn’t want to have leftovers, so I cut the batch down to make about 4 cups. To do that I used 1.5 cups rice and 2.25 cups broth. I reduced the lime juice and cilantro accordingly as well (estimated). I didn’t actually store the meals with the salsa container inside the larger glass container. The small square Ziploc containers that I used for the salsa (photo below) were too tall to properly close the lid on the glass containers, but I put them in there for the photo so that everything could be pictured together. Another great optional side for this meal would be Warm Corn and Avocado Salad! Want to make your own salsa for dipping? Check out my Fire Roasted Salsa. 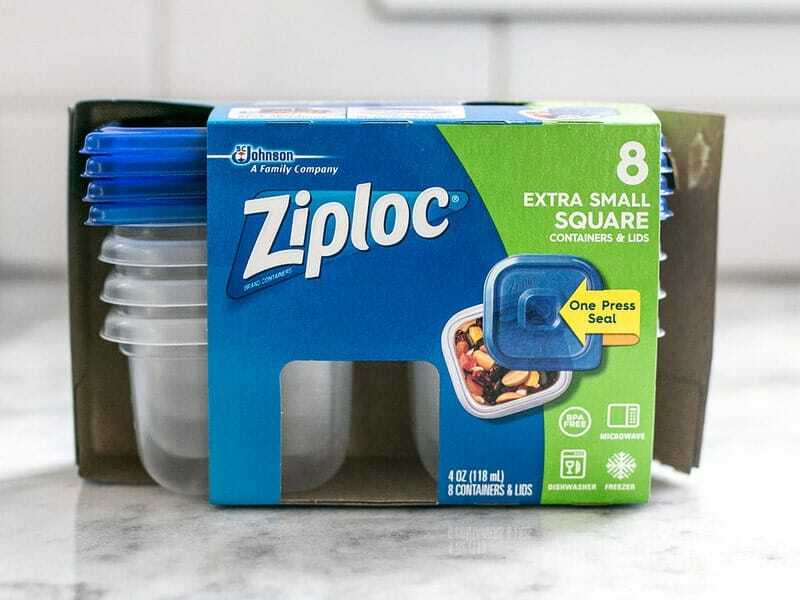 These are the little square Ziploc containers that I used for the salsa. They come 8 to a pack, which is great because I’ve lost at least four of my last set. LOL. I got these at Target. 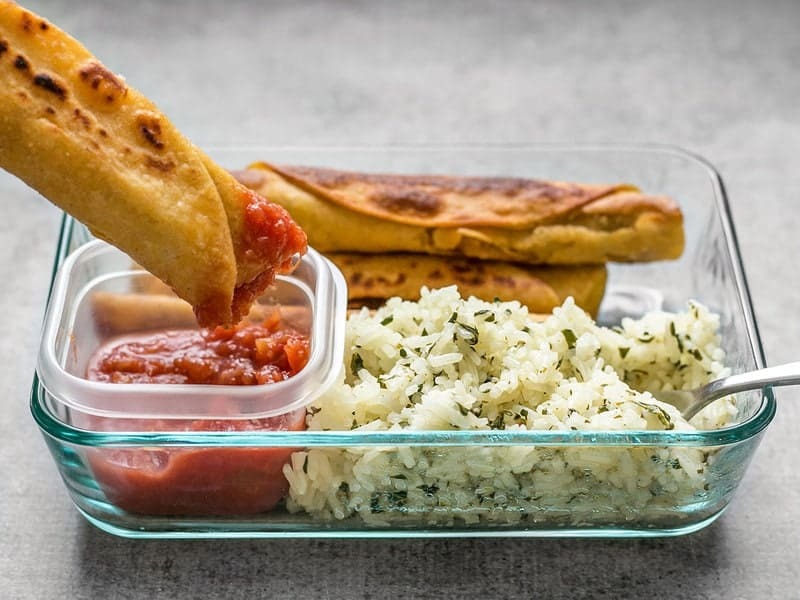 The wide, shallow, one compartment glass containers pictured above are made by Pyrex and purchased from Amazon (upon suggestion from many readers). So far they’re great! And that’s it for this week! Enjoy your lunches! By chance would know how many calories would be in this meal prep? I’m sorry, I don’t have nutritional info. I usually refrigerate them for about four days. For some recipes, like soups, stews, and some others, if it makes a huge batch I’ll freeze a few as well. This one in particular is probably best just refrigerated, though. The key to rolling corn tortillas is to have wet hands and warm tortillas. I learned that the hard way with the first batch. The microwave truck didn’t work for me. Do you have any idea about what the general macros count is per meal? No, I’m sorry, I don’t have that information. What brand of taquitos did you buy? I bought some chicken ones and they are not healthy at all. I made my own taquitos. The recipe is linked throughout this post. This is definitely one of my favorite recipes from your site! Though I’ve stopped frying them and started rolling and baking them… I’m crammed for time when I get home with the kids and it takes to long! My husband usually eats everything without complaint, but these he actually requests! Im curious, do you freeze your recipes, or just refrigerate them? I really want to make meals thall hold up made on sunday and eaten thursday. I love these meal prep recipes! They make grocery planning so much easier. Takes the work from me. I plan on making this tonight. Thanks so much! I wonder if you can use Greek yogurt in place of the cream cheese? 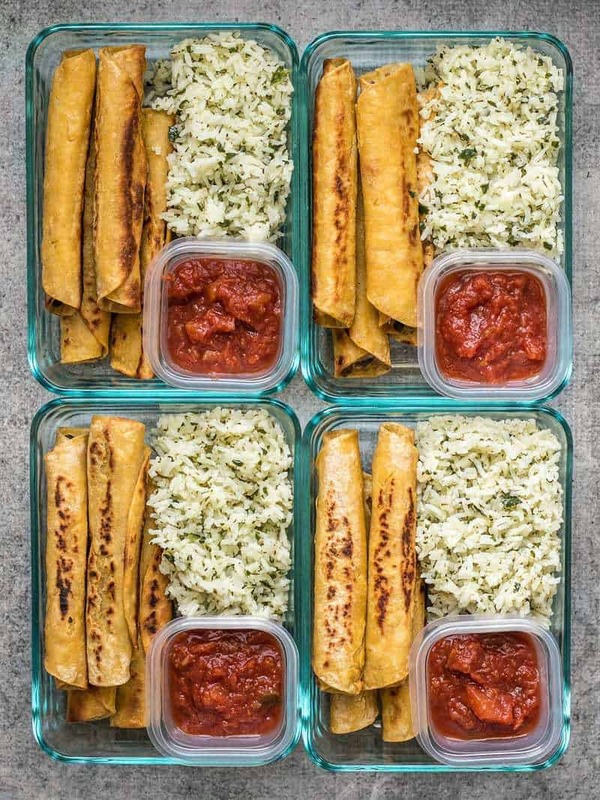 These look delicious and are saved for upcoming meal prep. Thank you for sharing! Personally I don’t think that would be a good substitute. The flavors and textures are too different. Ooh! I’m dairy-free, so will have to use Tofutti cream cheese, but will still give this one a try. I love this series — I’ve done the fajita veggie meal prep, a modified white chicken chili meal prep (using a white chicken chili recipe I already had), and the garden turkey meatloaf meal prep, and they’ve all been amazing! Thanks so much for the suggestions! I’m loving these meal prep plans you’re coming up with!! Please keep them coming! All that I have to say is YUM! Can either of the rice recipes be made with brown rice or would the cooking method have to be altered? Have you tried Uncle Ben’s Brown Rice? Cooking time is about the same as white rice. Just cook the rice according to the package and add the seasonings after cooking. I make a cilantro lime rice with brown rice pretty regularly. I usually make the cilantro-lime rice with brown rice. Check on the rice package to see what volume of water you need. If I need more liquid I add extra water to the pot and cook for the amount of time stated on the rice package (instead of the recipe time). I find brown rice has a stronger flavor than white rice so if I want more flavorful rice I add extra seasonings/salt at the end. Hope this helps!